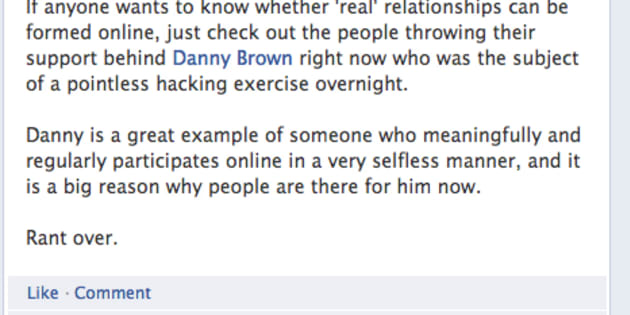 My friend Danny Brown had his Facebook account hacked last Saturday. The experience I am about to relay had left such an indelible impression on me, I felt compelled to write about it. Last weekend was a doozy. It never occurred to me, until some recent events, how wary we have to be about our online presence. The fact is we are NOT in control. 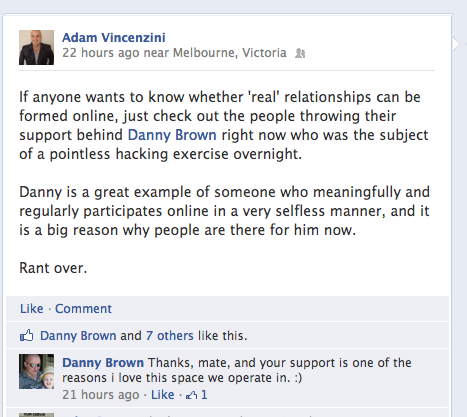 My friend Danny Brown had his Facebook account hacked last Saturday. The experience I am about to relay had left such an indelible impression on me, I felt compelled to write about it. You see, this was no ordinary hack. Danny Brown is a prolific blogger and one of the strongest influencers in the social media industry. He is one of the most engaging individuals on Facebook and Twitter. When he posts on his blog, on his Facebook or Twitter, many people read will listen and respond. You could say he is like E.F. Hutton for social media. So, when he started posting some pretty disturbing stuff on his Facebook page on Saturday, everyone took notice. I invite you to read the blog he posted: Facebook Hacking and the Value of Social Currency. While Danny and his family was out for dinner, someone hacked in to Danny's Facebook account and started playing with his profile and his friends. A friend texted me telling me about what Danny had posted. I immediately went on Danny's profile only to be shocked and worried for Danny at the same time. What he was posting sounded like a man in desperation; a man who seemed at the end of his rope. As per Danny, "Two of the public updates that brought the email questions were "Are you hiring? ", insinuating that I was disillusioned at Jugnoo - which couldn't be further from the truth - and "What do you really think of me?" as a "marketing experiment". I read the thread of comments. Friends were supportive and tried to console him. For the most part, however, many were questioning whether this was really Danny posting. It just didn't seem like something he would do. As a friend, Lindsay Bell, said to me, "Danny is my rock. He would never do this. This is NOT him!" I have to admit that I did question, even for a moment, why he would say these things? Then it occurred to both Lindsay and I that how he spoke, his vernacular was not the language of the fiery Scotsman we've come to know and love. We were consoled shortly after when Danny posted on his Facebook, "Damn - leave for dinner and your Facebook account gets hacked. Interesting. Sorry for any crap on here, working with FB to track back who hacked." Almost 70 comments from friends ensued, everyone lending their support around a man who, ironically, has been one of the strongest evangelists for this space. This is evidence of the type of rallying that happened last night: . What was scary was witnessing how the hacker was able to screw with Danny's reputation, even for a short period: texting his friends, changing Danny's marital status, his job status and outright slandering him using Danny's weapon: His Facebook Page. Until Danny validated that his account had indeed been hacked, we were not 100% sure that this was truly the case. As much as we all know Danny, there was still a nagging skepticism (even for a moment) about whether this was the work of a hacker. Some of us were indeed fooled. While we are careful of the information that we share there is enough content that we leave behind that allows someone to conceivably walk in our shoes and come out unscathed. I tell my kids the dangers of online and how we can't put our trust in people whom we don't know. Now do we have to question each other online? It's scary to think the same person I tweet and talk to everyday could very well be an impersonator. Don't Let the Hackers Win! Allow your community to support you. If you are an avid Facebook user or Tweeter, you've already developed a close community and a reputation. Your network knows you- your online disposition, who you interact with; and the nuances of each of your relationships. When the chips are down, you can rely on your community to support you. In Danny's case, we questioned his online persona at that moment and we attempted to contact him to get to the truth and/or to warn him. Change your password frequently. All of us (me included) use the same password for eternity. Rarely do we change it." Remember that anyone with access to your email accounts can request a new password for your Facebook account." Click here to change your password on Facebook. Change your Security Settings on Facebook. This is very important. Ensure that you click on : Secure Browsing to ensure you are browsing Facebook using a secure connection (https://facebook.com NOT http://facebook.com). Click here to find out more. Enable your log-in notifications. Facebook can notify you via email or text when your account is accessed from a computer or mobile device that you haven't used before. Enable recognized devices. If you enable another device (e.g. another computer or phone) to access your account, ensure that you add it. You won't have to confirm your identity when logging in from these devices. Enable your active sessions. This reveals the active sessions you have not logged out of on Facebook. It will contain approximate location and devices. Check your Active Sessions at least once a week to validate you are the only one accessing your account. Protect your Privacy. Control your default privacy and who can see your updates. This setting will apply to status updates and photos you post to your timeline from a Facebook app. Like Danny said on Twitter, "This experience has been an eye-opener even for this veteran". Please protect yourself.